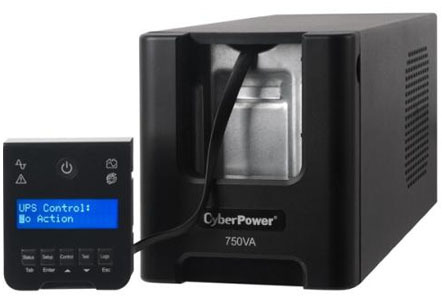 The CyberPower Smart App Sinewave PR750LCD mini-tower uninterruptible power supply (UPS) with LCD Control Panel and pure sine wave output is Active PFC compatible for safeguarding mission-critical servers, telecom equipment, VoIP and internetworking hardware that require seamless pure sine wave power. Its full Automatic Voltage Regulation (AVR) boost/buck topology delivers a consistent and clean AC power, protecting connected equipment and preventing costly business interruptions. Patented GreenPower UPS advanced circuitry reduces UPS energy costs by up to 75% compared to competitive models.The LCD Control Panel provides 41 different settings to check status and customize the operating settings for the PR750LCD, plus it can be removed and mounted separately from the UPS for ease of use regardless of where the UPS is installed. Functions include menus for checking power status on (11) different parameters, (23) settings for setup and control of the UPS, (3) battery test & calibration options, and (4) selections in the Log menu. With its attached cable the LCD Control Panel can be removed from the UPS and relocated up to 4.5 FT away from the UPS for ease of viewing when installed in hard to reach locations.The PR750LCD unit has a capacity of 750VA/525Watts, six (6) NEMA 5-15R receptacles and two (2) maintenance-free, user-replaceable 12V/7.0Ah batteries. This unit offers connectivity via one (1) HID USB, one (1) DB9 serial and one (1) emergency power off (EPO) port. EMI/RFI filters increase the immunity of the load to noise disturbances. When operating on battery, the Smart App Sinewave UPS outputs power with a pure sine wave that is identical to or cleaner than the power from the utility company grid, free of harmonic distortion and electrical noise, resulting in optimal line clarity. The innovative LCD interface enables users to check UPS Status, manage UPS Setup & Control, and run Testing/Battery Calibration options. Status and Log menus provide UPS vitals including input & output voltage levels, battery information, run-time estimates, load information, event and fault logging, and other system information. The Setup and Control menus offer users the ability to customize their PR750LCD UPS to their specific parameters of operation including shutdown options, voltage sensitivity, alarm settings and other parameters. The Test menu enables self testing and battery calibration to insure your UPS is operating correctly. The LCD Control Panel on the PR750LCD can be removed and relocated for easy viewing using the attached 4.5 ft. cable. This feature provides easy access to view status or change settings on the UPS when its installed in a hard to reach area such as the bottom of a rack, under a desk, in a crowed IT closet, or on the floor. Full AVR boost/buck topology stabilizes the AC voltage by increasing low voltages and decreasing high voltages to maintain a safe voltage level without switching to battery-mode. This conserves battery life, and delivers cleaner AC power to connected equipment. 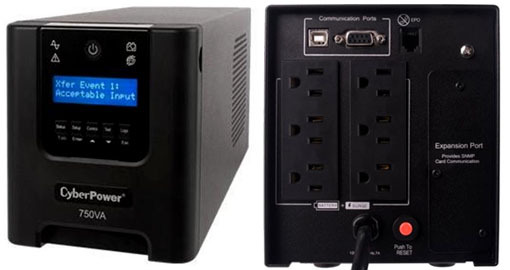 CyberPower assists users with any product, installation, or warranty concerns—free of charge.